William Mitchell Nash (June 24, 1865 – November 15, 1929) was a Major League Baseball third baseman. 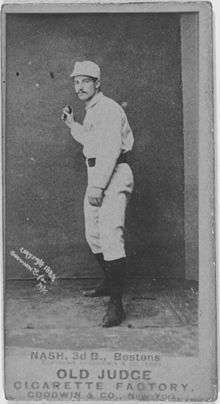 He played fifteen seasons in the majors, from 1884 until 1898. He also served as player-manager of the Philadelphia Phillies in 1896. The Editors of Total Baseball (2000). Baseball:The Biographical Encyclopedia. Sports Illustrated. p. 825. ISBN 1-892129-34-5. This article is issued from Wikipedia - version of the 3/23/2016. The text is available under the Creative Commons Attribution/Share Alike but additional terms may apply for the media files.